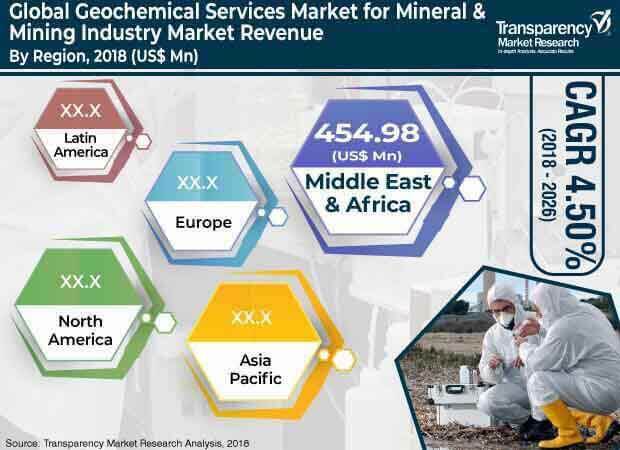 The global geochemical services market for mineral & mining industry was valued at US$ 927.63 Mn in 2017 and is anticipated to expand at a CAGR of more than 4.50% from 2018 to 2026, according to a new report by Transparency Market Research (TMR) titled ‘Geochemical Services Market for Mineral & Mining Industry – Global Industry Analysis, Size, Share, Growth, Trends, and Forecast, 2018–2026.’ Geochemical services refers to the study of origin, evolution, and distribution of chemical elements on earth that are contained in rock-forming minerals and products derived from these elements. Geochemical services consist of various testing services such as sample preparation, aqua regia digest, mixed acid digest, X-ray fluorescence, hydrogeochemistry, and fire assay. These services can be laboratory based, where the testing is carried out in a geochemical laboratory with the help of geochemists; or in -field based, where the testing is carried out directly on field with the help of a portable laboratory setup. The sample preparation service is most widely used testing technique across the globe. Growth in the industrial sector and rise in demand for metals, minerals, ores, and precious metals, especially in developing economies such as China, India, Brazil, and countries in ASEAN, are expected to drive the market during the forecast period. Increase in industrial investment is anticipated to boost the demand for metals and metal-alloys. Geochemical services are primarily used in the exploration stage to determine the type and quantity of elements present in the area. Several tests are carried out for exploration of resources before commercial production or extraction of minerals. X-ray fluorescence makes it possible to obtain high level of purity in sorting materials irrespective of size, moisture, or surface pollution level. Mining companies across the globe have started the application of geochemical services before commencing with the mining process. This is projected to create lucrative opportunities for the geochemical services market for mineral & mining industry. Based on service, the geochemical services market for mineral & mining industry has been segmented into sample preparation, aqua regia digest, mixed acid digest, X-ray fluorescence, hydrogeochemistry, fire assay, and others (including carbon and sulfur analysis and mobile metal ion analysis). Sample preparation was the dominant segment, accounting for around 26% share in terms of value in 2017. The X-ray fluorescence segment is expected to expand at a rapid pace during the forecast period. In terms of region, the global geochemical services market for mineral & mining industry has been segregated into North America, Latin America, Europe, Asia Pacific, and Middle East & Africa. Asia Pacific held leading share of the global geochemical services market for mineral & mining industry in 2017. This can be ascribed to the growth in industrial investment in countries such as China and India. The market in Asia Pacific is anticipated to expand at a significant pace during the forecast period, primarily due to the increase in demand for metal and minerals in the region, especially in China and India. Key players operating in the global geochemical services market for mineral & mining industry include Bureau Veritas SA, Intertek Group plc, SGS SA, ALS Limited, Shiva Analyticals & Testing Laboratories India, Geochemic Ltd., Activation Laboratories Ltd., ACZ Laboratories, Inc., Alex Stewart International, and AGAT Laboratories Ltd.